Semiconductors are an integral part of any modern electronic circuit and are used in various applications from LED lighting to motor controls to build an energy efficient system. 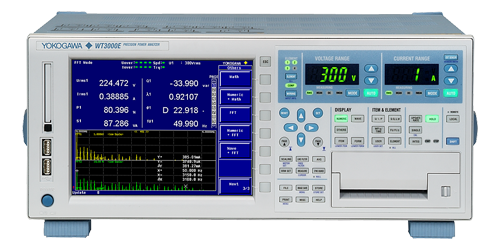 The WT3000E’s high accuracy and stability along with the capability to perform harmonic and flicker measurements according to IEC standards place it at the heart of the semiconductor test system. In order to achieve higher efficiencies it is important to measure power at higher accuracies. The WT3000E provides basic power accuracy of ± 0.01% (reading) in the guaranteed accuracy range from 1% to 130%. Semiconductors are used in various products such as high end power supplies, LED lighting, solar panels, motors & drives, Hybrid Electric Vehicle (HEV) / Uninterruptible Power System (UPS). 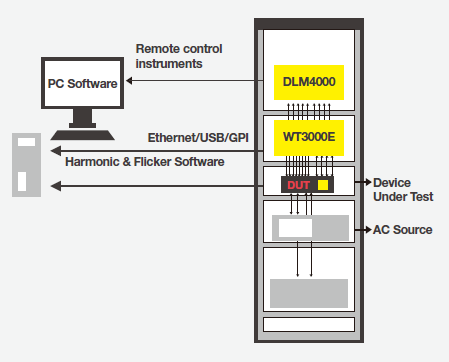 It is important to perform harmonic and flicker analysis tests according to IEC standards. The WT3000E along with the 761922 software provides the option to perform either precompliance testing or 100% compliance to the latest IEC61000-3-2, IEC61000-3-3 & IEC61000-4-7, IEC61000-4-15 standards.